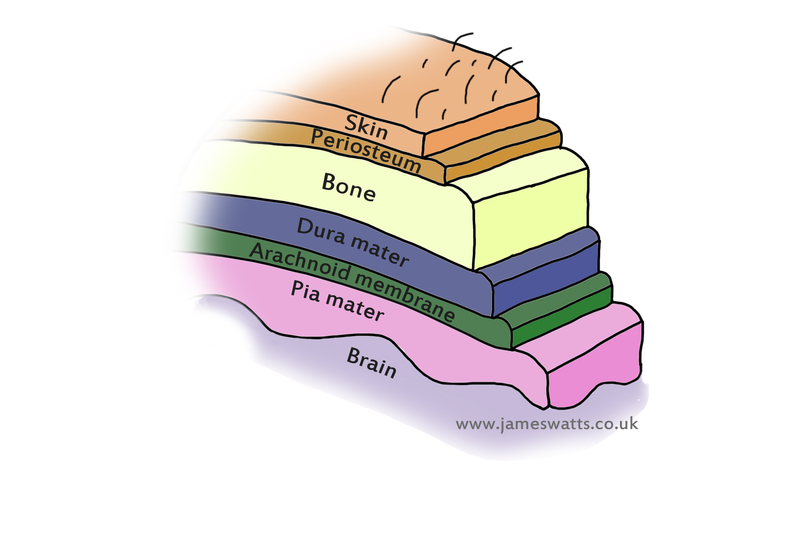 The primary function of these layers is to protect the central nervous system. The outermost layer of the meninges and therefore closet to the skull is the Dura mater; it is a thick and tough layer composed of dense fibrous tissue which wraps almost entirely around the whole brain and spinal cord. There is little space between the Dura mater layer and the layer below/the bone above it, the exception to this is when (not in the meninges of the spinal cord) the Dura mater splits into two layers forming a gap between them, which is known as the venous sinus. The Dura contains larger blood vessels which split into the capillaries in the pia mater. In the cranium, the Dura mater also acts as another layer of periosteum, however in the spine there is an epidural space (filled with fat) which separates the Dura mater and periosteum. The arachnoid layer is much thinner than the Dura mater and contains a lot of underlying space which is filled with CSF (cerebrospinal fluid). This space is known as the subarachnoid space. The arachnoid space is so called because of its spider web-like appearance. It provides a cushioning effect for the central nervous system. This is a very thin and delicate layer which intimately follows the surface of the brain and spinal cord. It is highly vascularised tissue and its capillaries are responsible for nourishing the brain. Cerebrospinal fluid (CSF) is a clear, saline bodily fluid that occupies the subarachnoid space and the ventricular system around and inside the brain. It is produced continuously at a steady rate and is essential for the normal functioning of the CNS. There is very little protein and virtually no cells present in normal CSF, only around 35mg per 100ml compared to 7,000mg per 100ml in typical serum. It is therefore a greater proportion of water (99%) compared to 93% in serum. CSF is produced in the brain by modified ependymal cells in the vascular choroid plexus (approx. 50-70%), and the remainder is formed around blood vessels and along ventricular walls. Both filtration and secretion occurs by epithelial cells. Generally CSF flows from the lateral ventricles, through the foramina of Monroe to the 3rd ventricle, then through the cerebral aqueduct (of Sylvius) to the 4th ventricle. It then mostly flows out of the lateral foramen of Luschka and into the cisterna magna (a dilation of the subarachnoid space), or caudally into the central canal of the spinal cord. Generally CSF will exit via the arachnoid villi. There are other possible routes of drainage however; such as absorption by venules in the pia mater, through spinal veins and lymphatics (around the roots of the spinal nerves) and by direct venous drainage from the subarachnoid space into the venous sinuses. CSF can be sampled from an organism by cisternal puncture. The CSF should flow into the container without the need to draw it in, due to pressure. No more than a maximum of 1ml per 5kg of body tissue should be extracted. The brain and spinal cord use a series of dural sinuses, in addition to veins to remove CSF and venous blood. Dural sinuses have no valves, (the venous system of the cranium generally has few valves). A similar system exists to drain venous blood from the spinal cord. There is a direct continuity with the cranial sinuses. CSF and venous blood drain via intervertebral veins into either the vertebral, azygos veins or the vena cava. 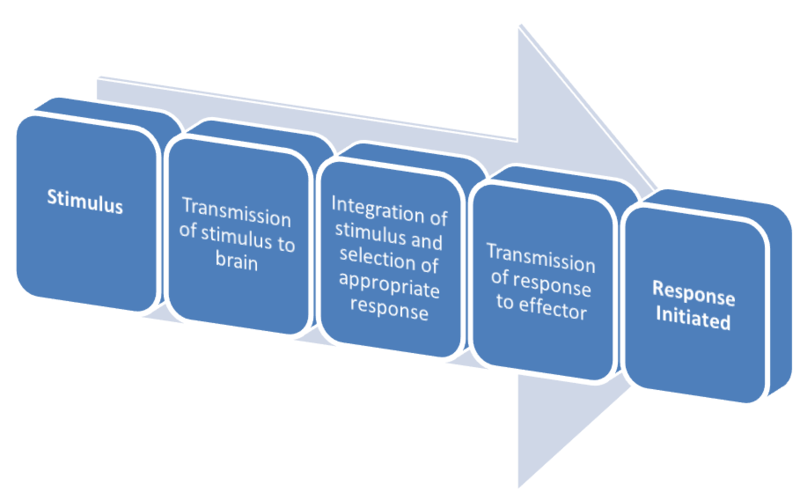 Compared to other tissues, the brain is extremely dependent on a stable and efficient blood supply. Despite making up only 2% of total body mass, the brain requires 15-20% of total cardiac output; this makes the brain extremely sensitive to hypoxia. Any hypoxic damage caused to the brain becomes irreversible after only a few minutes. In normal tissue, there are three typical forms of metabolites utilisable for energy, these include; glucose, fatty acids and ketone bodies. However, in the brain only glucose can be utilised, except under extreme conditions, such as starvation. During these harsh conditions for the brain, ketone bodies may be used for energy. Because of the brains dependence on glucose, hypoglycaemia will result in dizziness and confusion as the brain is starved of energy. The Circle of Willis is a circular network of arteries that supply blood to the brain. It acts as a redistribution centre for blood which is supplied to the Circle of Willis; blood is brought together here and then moved to the brain. The Circle of Willis sits directly beneath the brain. The arrangement of the brain’s arteries into the circle of Willis creates redundancies in the cerebral circulation. If one part of the circle becomes blocked or narrowed (stenosed) or one of the arteries supplying the circle is blocked or narrowed, blood flow from the other blood vessels can often preserve the cerebral perfusion well enough to avoid the symptoms of ischemia (restriction of blood supply). Fig. 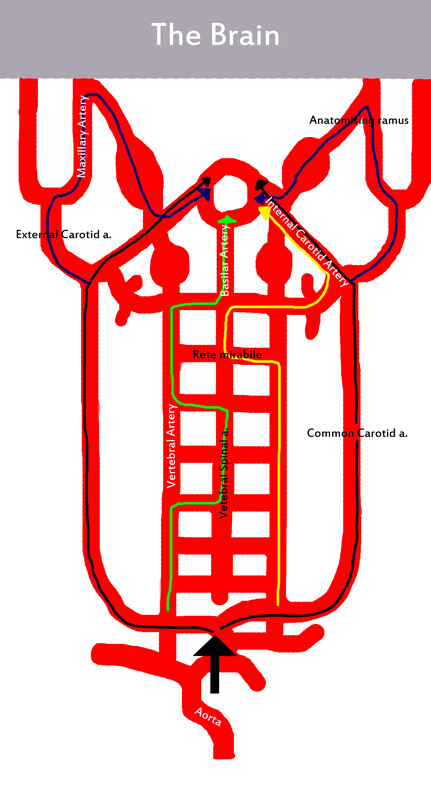 1 – The arterial supply to the Circle of Willis, the different routes all begin by flowing in through the aorta. At the Circle of Willis, the arteries anastamose (join together) to form a ring. Fig. 2 – The Circle of Willis, upon reaching the Circle of Willis blood is then distributed further heading towards the brain. 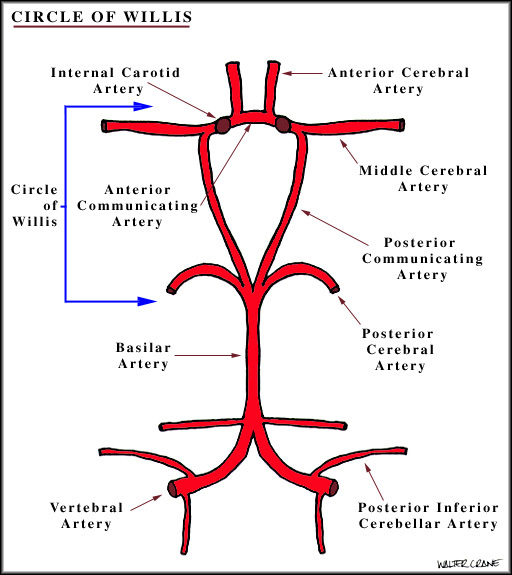 The blood supply from the Circle of Willis is shown in Fig. 3. The terms rostral (front) and caudal (back) are interchangable with the terms anterior and posterior respectively (these terms are used in human medicine). A rete mirabile is present in sheep, goats, swine, ox and dogs and is located in the venous cavernous sinus. The cat has a rete mirabile present also, however it is located extracranially. Retia Mirabilia are absent in the rat and rabbit. During embryonic development in the cat, the internal carotid artery degenerates. In other species the internal carotid artery is typically a major artery in terms of direction of blood flow (see fig. 1). The maxillary artery compensates and becomes the major supply of blood to the Circle of Willis. Additional supply is also aided by a greater developed pharyngeal artery. This degeneration of the internal carotid also occurs in adult sheep, cows and pigs. The Circle of Willis’ structure can differ between species; this has even been observed between different breeds of dogs. The typical example is that some dogs completely lack a rostral communicating cerebral artery altogether. Human & Dog – The Circle of Willis receives blood by both the internal carotid and the basilar arteries. (Fig. 1) This means blood supply to the forebrain mainly originates from the internal carotids. Caudal areas of the brain are typically supplied with vertebral arterial blood. Cats, Sheep & Pigs – The internal carotid is much less important; the maxillary artery supplies the Circle of Willis via the anatomising ramus. In this situation the basilar artery carries blood away from the Circle of Willis (unlike in man). This means most blood supply to the forebrain and midbrain is derived from the maxillary artery. 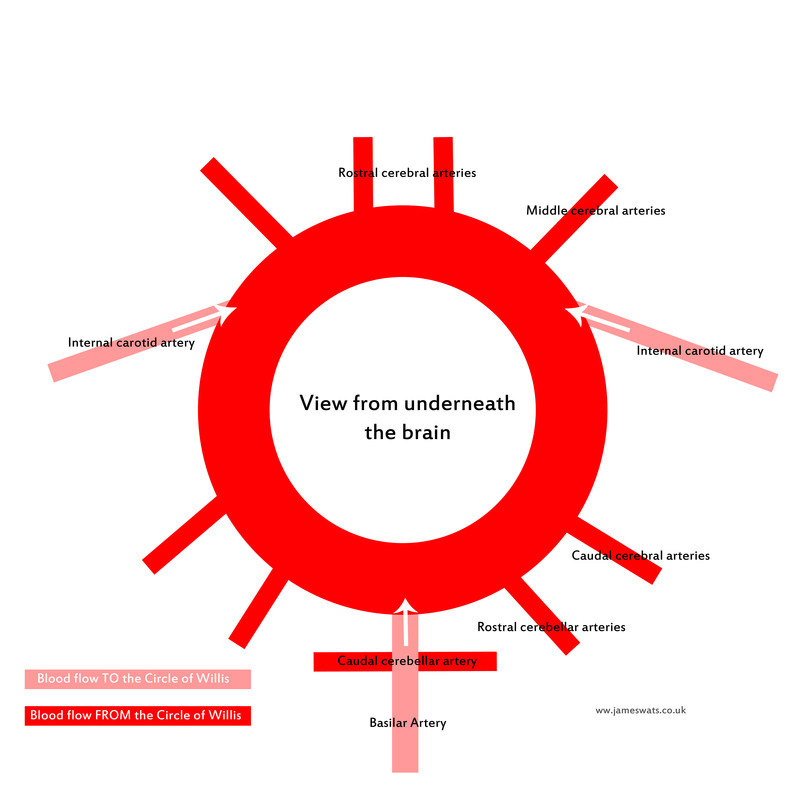 The Ox – Blood again flows away from the Circle of Willis via the basilar artery. Blood enters the Circle of Willis via maxillary and vertebral artery pathways, which are well mixed -meaning all areas of the brain, are supplied with blood from mixed maxillary and vertebral arterial origins. These arteries are joined by various anatomising arteries which form an arterial ring between the ventral spinal and dorsal spinal arteries. Chemical autoregulation – In all systems, blood flow is locally regulated. When O2 tension falls or pCO2 increases local vasodilation occurs. This results in increased blood flow (Increased oxygen delivery and CO2 removal). The situation is similar for the brain within the restrictions of the inelastic skull. Sympathetic control – A sympathetic drive constricts blood vessels (vasoconstriction) which causes hypoxia. Vasodilation occurs as a result which increases the volume of the brain within the skull causing pressure and pain. Myogenic autoregulation – As pressure increases within cerebral arteries, muscle responds by constricting to prevent increased blood flow. To protect the brain tissue, a blood-brain barrier is in place. This prevents unwanted substances crossing into brain tissue freely; certain transport systems are in place to selectively transport required substances. Glucose and ketone bodies do not freely pass through the blood-brain barrier they are instead specifically transported across the barrier. It is believed than even molecules such as water require selective transport across the blood-brain barrier, water is moved across by aquaporin transport proteins. 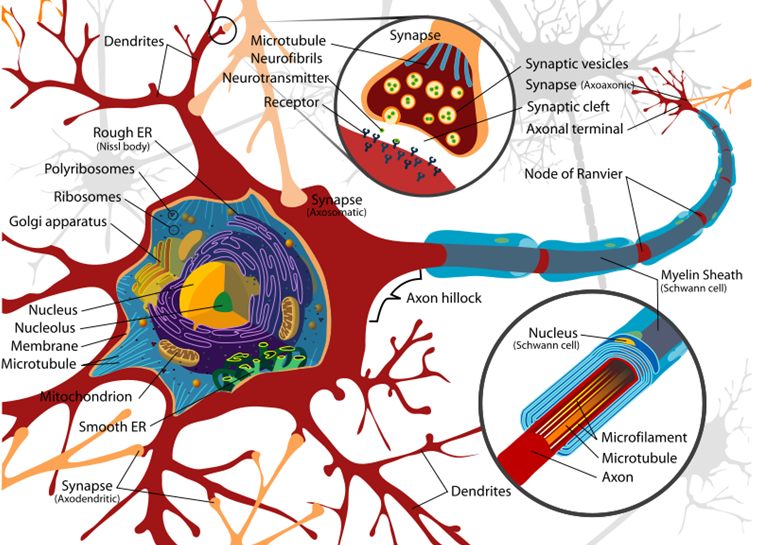 In simple terms the brain capillaries are surrounded by ‘astrocyte feet’. These astrocytic feet serve to regulate the blood brain barrier in some way. The capillaries are not fenestrated, but bound together with tight junctions. This prevents simple diffusion of substances between the gaps as would happen outside the CNS. Pericytes site alongside the capillaries, these may be involved with capillary proliferation. Astrocytic feet surround the capillaries and their role appears to be in the formation and maintenance of the blood-brain barrier complex.